We believe that giving back to the community is not only a key part of our business - but an essential one. Which is why each year we partner with as many charities as possible to be recipients of our #pappasgivesback campaign. Through this program we are able to provide low or no cost painting to organizations that are doing some incredible work in our community. 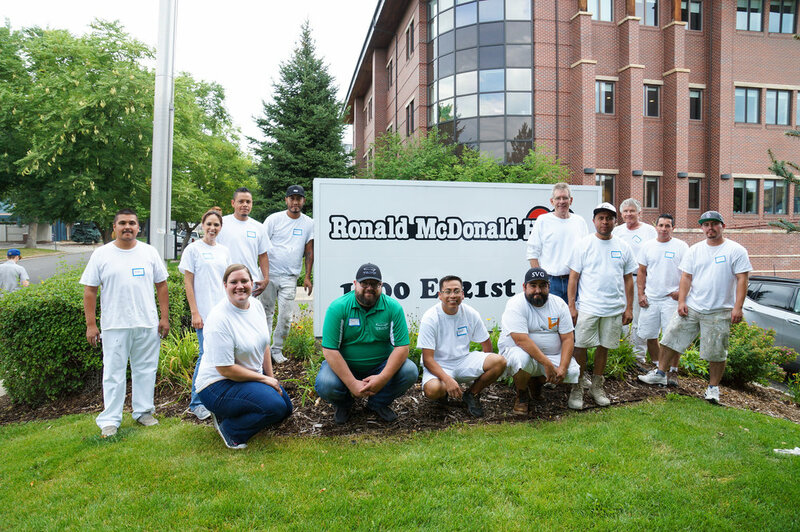 Through the coordinated and dedicated efforts of our painters, supplies and administrative staff, we are happy to give back to the community that has sustained us from the very beginning. Below are just a few of the organizations we have partnered with through the #pappasgivesback campaign. Each year we select one recipient to be our primary charity partner for the year. We specifically look for an organization that is making an incredible impact in the community and that we have a personal connection to. Through some twists and turns in the best possible way - we were connected with the team at the Ronald McDonald House in Denver. We found out that their offices, conference rooms, kitchen and copy rooms were in desperate need of repaint. While we had all heard of RMH before, being able to tour the house and learn more about what they do for the community touched us so deeply that we knew they should be our charity recipient for 2018. It was our goal from the very first step that this entire project would be done at no cost to them at all. Not one penny. In case you aren’t aware of just how much they do there - well, prepare to be amazed. The RMH houses serve as a safe, clean and comfortable resting place for families who have children needing urgent or extensive medical care. That care could range anywhere from a preemie who hasn’t been cleared to go home, to a child receiving cancer treatments or waiting on an organ transplant - just to name a few. All of the families that stay at RMH live at least 60 miles away, so it is too far for them to commute home and thus the mission of RMH; “Keeping Families Close” was born. The houses are bright, sunny and inviting and the attitude within the home is of thankfulness, joy, optimism and support. Whether a family is staying there for a few days or months on end - the RMH houses truly turn into a home away from home. We cannot imagine what it is truly like for the families who are staying at the homes - but one thing we know absolutely for sure - that the world is a better place because of the staff, volunteers and mission of the Ronald McDonald House. This project would not have happened if it hadn’t been for the selfless dedication of our team and vendors. 15 of our painters and 5 of our staff donated their time to the project, Guiry’s and Benjamin Moore donated all of the paint and supplies and 3M donated all of the tape needed for the project. Thank you to all who gave to help this project come to life! It truly takes a community to support the community. "In partnership with schools, community organizations and at our center in West Colfax, we focus on the development of the whole girl. She learns to value herself, take risks, and discover and develop her inherent strengths. The combination of long-lasting mentoring relationships, a pro-girl environment, and research-based programming equips girls to navigate gender, economic, and social barriers, and grow up healthy, educated, and independent. Informed by girls and their families, we also advocate for legislation and policies to increase opportunities and rights for all girls." With a mission like that - who wouldn't want to be a part of what they're doing?! Hats off to you Girls Inc - we're supporting you 100% on what you're doing! The Conflict Center provides a valuable resource to the community by providing classes and instruction in - simply put...working through and preventing conflict. Their mission is to “prevent physical, verbal, and emotional violence by partnering with individuals and communities to shift perceptions, attitudes, and behaviors through education and skill-building..” In an age where it feels like conflict is lurking around every corner - or dinner table - we are very grateful for the resources they provide and as such, we were happy to provide some of our resources to them in the form of a facelift for the outside of their building. It's amazing what a new coat of paint will do to refresh and brighten a space. 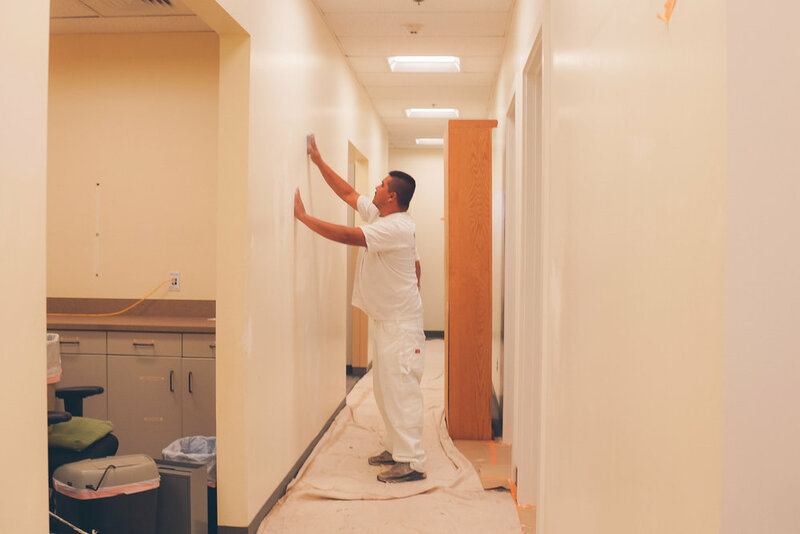 We donated a portion of the exterior repaint of the building and trim to help take that project and part of its expense off their plate so they could redirect those funds in to furthering their work. We came across the SAME Cafe through a friend and as soon as we heard about their mission we knew we needed to be involved. It's amazing how often we take for granted the simple blessing of having enough food to eat and knowing where our next meal is coming from. So All May Eat - SAME.... what a great name. Two of our VP's have a background in this area and know how important a good meal is to improving one's health and outlook on life - Tony's background as a chef and Jen's background volunteering in Romania as a teen. So, this project struck a cord for both of them personally. The SAME Cafe's mission is simple - "SAME Café is a donation-based, fair exchange restaurant that serves healthy food to everyone, regardless of ability to pay. Our mission is to create community through healthy food access. We believe in healthy food, community, and dignity for everyone." They provide an incredible service to our community, and we were honored to take a small project off their plate. 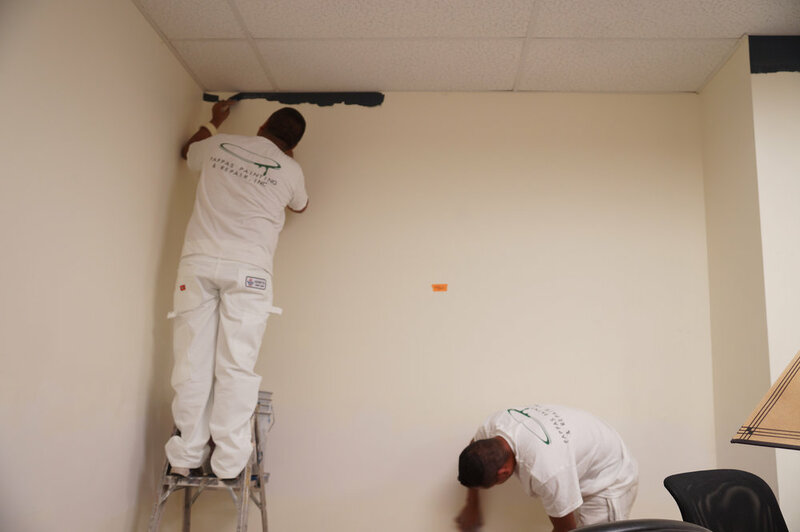 Through the combined efforts of PPR and Sherwin-Williams, we were able to repaint a the ceiling and ductwork in their dining area without impacting their meal service and with very minimal costs to them. Our painters were happy to work the after-hours shift needed to complete the project and our friends at Sherwin-Williams donated all of the paint that was needed.